Tix will be $5 at the door, $20 with CD! Jaymz Bee and the Royal Jelly Orchestra release their highly anticipated TORONTO LAUNCH PAD album! Featuring some of Toronto’s finest singers and musicians, TORONTO LAUNCH PAD includes; Elizabeth Shepherd, Genevieve, Julie Michaels, Marieve Herington, Alex Pangman, Michael Danso, Serafin, Lyne Tremblay, Jef Farquharson singing and musicians Walen Miki, Bradi Disterheft, Great Bob Scott, Kevin Clark, Coleen Allen, RJ Sacthinananthan along with guest cameos by Tony Quarrington, William Carn, Richard Underhill and Sarah McElchran. Many of the performers on the CD will perform live at Stone's Place during the CD Release party! 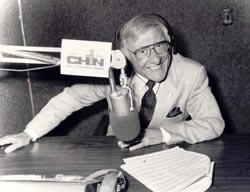 CHIN Radio proudly announces the 40th Anniversary of the CHIN International Picnic - A Free International Festival of Entertainment for people of all ages. Bullhorn has a full line-up of some of the best talent in Toronto. From a small trio to a big band, we are happy to help you make your event a big success. We have hosts and entertainment available for private parties, corporate functions and charity events. To make changes to your contact info click here. To unsubscribe, click here or send an email to: email@bullhorn.ca.